I was perusing through my email yesterday and ran across this headline, "Gender-neutral Swedish Preschools Teach Boys to Wear Dresses". Honestly, I suddenly felt the need to release my breakfast on the floor. How does one justify this sickness of thought? We have an epidemic of a backwards society. 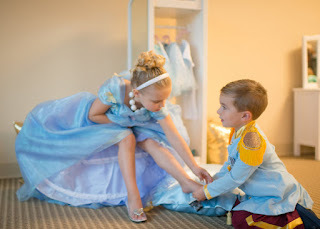 Men and now little boys are groomed and indoctrinated to become more in tune with their feminine side, while women and little girls are taught to be tough and manly; a complete reversal of God's perfect creation. This is not right. It grieves the heart of God. But not only that, it confuses the very definition of what God called "male" and "female". Yet I assume this declassification of gender is the whole agenda. So what does it look like to have a "gender-less" society? For one thing, it causes inward turmoil and confusion. Observing little boys from the moment they begin to talk and walk and get into things, they are simply wired to make noises, to be rambunctious, to rough-house, to hunt down bad guys, and be the great protector. They run through the hallways as caped crusaders and stomp through mud to rescue damsels in distress. This is how God made them. They are warriors in training. Not that they will all grow up and join the military or climb Mt. Everest or fight off a grizzly bear, but they have been created with the DNA of a provider and protector. God carefully knit them together in their mother's womb with all that they would need to become a man who will love and care for his family, provide for their needs, do physical tasks that require a man-sized strength, yet, be gentle enough to have high tea with his little daughter. A boy needs role models of godly men who can show him how to be a man; how to treat a lady; and how to stand up and fight for what is right, rather than cower in a corner. This world needs men who know who they are and who they were created to be, not more confused males, nor free-thinking parents and teachers who think it wise to force something on their child which directly goes against biological makeup and design. Little girls from the time they are toddlers are more tenderhearted and compassionate. They tend to nurture and want to help. Some love pretty things, others don't care as much, but I would venture to say that all want nothing more than to be loved and cherished. These little girls have a spirit about them that can melt the heart of their daddy--a foreshadowing of the love their future husband should have and their heavenly Father already has for them. God created these special little ladies to grow up and be a helpmate to their husbands; an equal partner, yet with a different role. Incredibly, they were given a body that can house another human being for 9 months, then love that little creature more than their own self. Though many women are tough as nails, there is still something special about them that sets them apart from their male counterpart. This is how God made them - unique. So in saying all of this, why would we want to mess up and confuse what God has already stated was good? Let the children be who they were created to be, and let's quit forcing them to adapt to cultural changes and sinfully warped viewpoints.